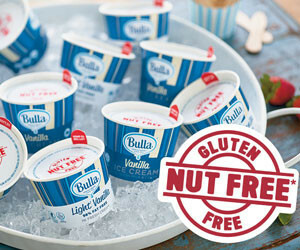 Bulla has extended its 2 L Nut Free Ice Cream into its 100 mL Ice Cream Cup foodservice range for use across hospitals, school canteens and aged-care facilities. 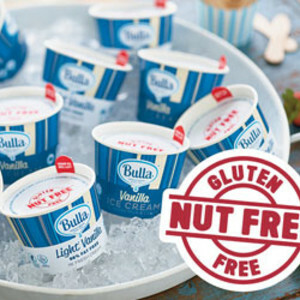 Made with fresh milk and cream, Bulla’s Nut Free Ice Cream is suitable for people with allergies to nuts. An entire factory has been dedicated to the production of this ice cream, along with a dedicated group of staff and suppliers who are educated on the quality and safety of the products manufactured. Bulla has a committed testing system analysing the incoming ingredients and finished products throughout the production process, to ensure the safety and quality of products without compromising on Bulla’s signature taste. The nut free 2 L and 100 mL ice cream cups are available in vanilla. Bulla’s nut free ice cream is also available in strawberry, chocolate and vanilla flavours in larger sizes suitable for food services. I am interested in Bulla Nut Free Ice Cream .